Carcassonne’s hilltop ramparts and towers are quite something to behold, by day or night. But, and I can not explain why, the enduring memory I have from my first visit in 1989 is of the monument erected in honour of the man who is credited with saving the fortified city from being demolished. So, during my recent visit to Carcassonne I headed straight for the memorial. 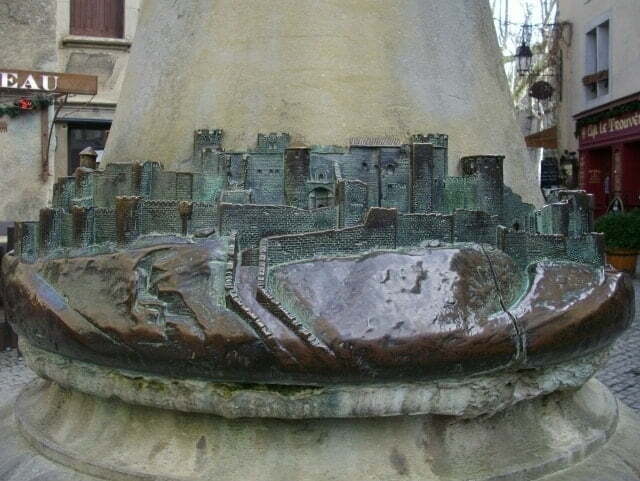 The memorial to Jean-Pierre Cros-Mayrevieille in Carcassonne. With well over three million visitors to Carcassonne each year, it is difficult to think while gazing up at the striking fortress city that in 1849 there was a government decree to have La Cité demolished. Although city folk were justifiably outraged by this, it should also be noted that the ramparts and the towers were in such a poor state of disrepair that Napoleon had it struck off the list of official fortifications. 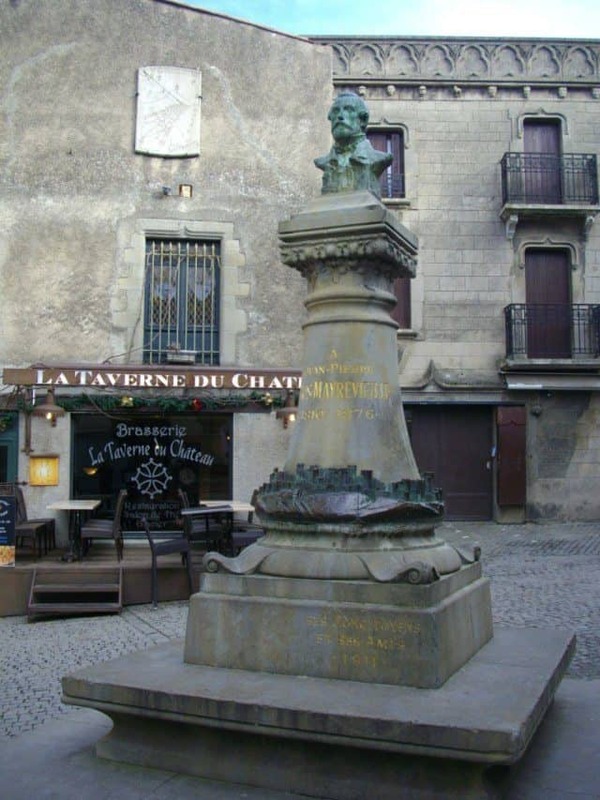 Now it just so happens that the Mayor of Carcassonne, Jean-Pierre Cros-Mayrevieille, was not only passionate about the history of his city he was also an inspector of historical monuments. It is not at all surprising then that he knew the writer and historian Prosper Mérimée. Mérimée was also an inspector of historical monuments, and had been involved in some high-profile, successful restoration projects, including Vézelay Abbey in Burgundy and Paris’s Notre-Dame Cathedral. Together Cros-Mayrevieille and Mérimée saved Carcassonne from being destroyed. As the Gothic- revival architect Eugène Viollet-le-Duc was already on site as it were, restoring the Basilica of Saint-Nazaire, he was tasked with the actual renovations. In a small square just along from the entrance to the castle a memorial to Jean-Pierre Cros-Mayrevieille was erected in 1911 by ses concitoyens et ses amis (his fellow citizens and friends). 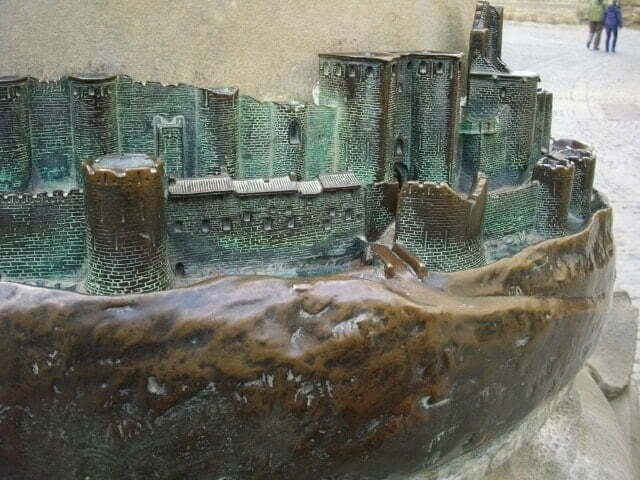 What I love about this memorial is the way the ramparts and towers, created in bronze, wrap around the base of the pillar that bears a bust to Cros-Mayrevieille. 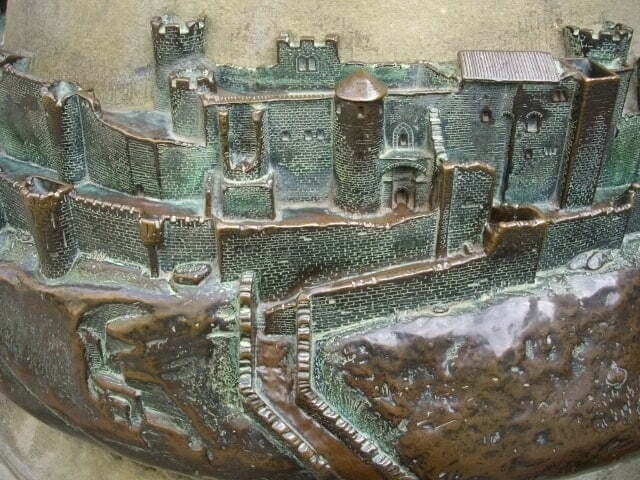 And its not a bad likeness of the walls either. If you are visiting Carcassonne, don’t miss it! NextTwinned Towns … What is Next, Sister Sites? That is an incredibly creative memorial, and I think I would do just as you did–go straight for the mini-castle. Although I would love to see the big one, too–those things can be a bit intimidating, and this gives you a better perspective. Now you’ve made me really want to see Carcassonne. Isn’t it a wonderful memorial, I am delighted you agree Vera. I shall be posting more soon in the next day or two – currently exploring the delights of Berlin. Carcassonne is a lovely place and I would definitely recommend a visit. 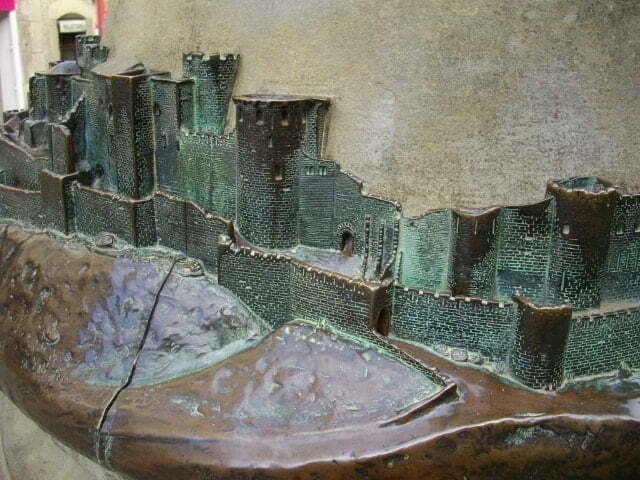 Bel Hommage à Cros-Mayrevieille et à la Cité sculptée autour de sa colonne Place du Château. Its a beautiful memorial no doubt. I pass by it everyday but its been a while since I actually took the time to appreciate it. I visited in July this year, what a fantastic place and I am so glad that it is now so well preserved. History is to be cherished for future generations. 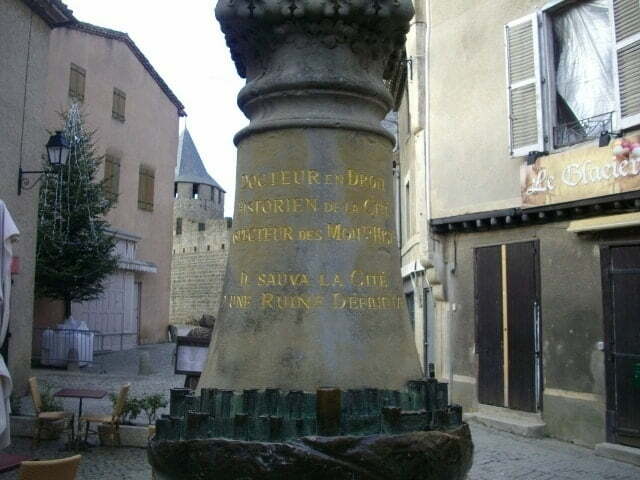 the whole town is a piece of living history, and the monument to monsieur Cros-mayrevielle is perfectly appropriate.